Aras – pencil and ink on paper 35×25 cm. Aras Laying – pencil and ink on paper 50×32 cm. Asil warrior – pencil and ink on paper 57×50 cm. His love for details, his accurate pictorial technique, and his partial application of colour all contribute to transforming these drawings into remarkably high-quality finished works. Therefore, they are not sketches, but finished works which stand apart and would be sufficient to regard the artist’s drawing and compositional skills as excellent. Then, true style exercises where nuances and shades play a very effective chromatic role, showing extremely refined manual skills. Pencil drawings by Roberto Piaia. Elena in Mirror – pencil and ink on paper 50×40 cm. Eva Gymnast – pencil and ink on paper 70×50 cm. Eva in Dance – pencil and ink on paper 33×24 cm. 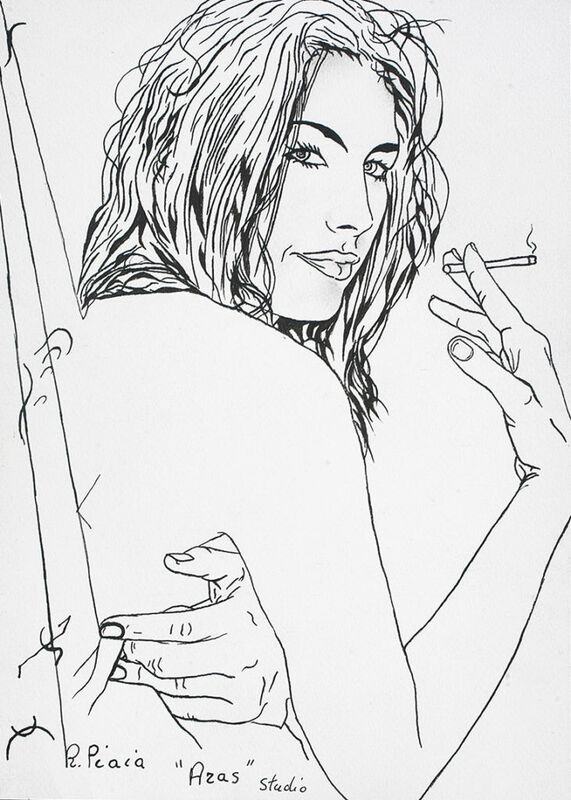 Eva – pencil, ink and oil on paper 72×50 cm. Cristiana -pencil and oil on canvas 80×80 cm. Unveiled -pencil and oil on canvas100x30 cm. Natalia in the Shade -pencil and oil on canvas 95×50 cm. Squirrel – pencil and oil on canvas 100×50 cm. Daria und Lucia -pencil, charcoal and oil on canvas 70×70 cm. In Piaia’s world, the visions are intertwined mediated by the affective sphere and the recovery of atmospheres linked to ancestral memories, all rendered with an effective communicative immediacy that allows the gaze of the observer to be lulled by an enveloping sensation of one ecstasy “Oneiric” dreamy.